Cochin chickens are well-known for their docile behavior and fluffy good looks. The Cochin breed is officially recognized in standard and bantam sizes as well as in a variety of color types. Female Cochins are excellent mothers, well-known for their strong maternal instincts. Cochins are calm chickens who are easily handled, so they're popular backyard pets. Today's modern Cochins are descendants of Asian chickens brought to England and America in the middle of the 19th century. During the 1840s, two different breeds of Asian chickens were imported to England. One breed originated from Shanghai in mainland China, the other from Cochinchina, a French colony in southern Vietnam. Queen Victoria received some of the chickens from Cochinchina and popularized the name "Cochin" for her breed of Asian chickens. The chickens from Shanghai proved to be more popular and were bred for attributes that resemble the modern day Cochin breed. 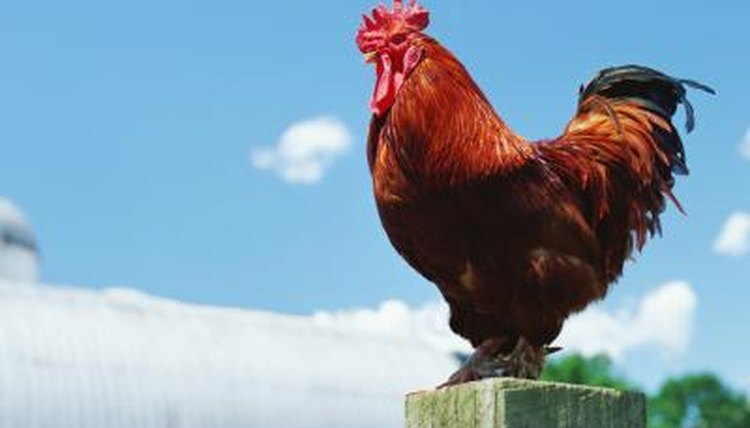 The name Cochin, became associated with the breed of chicken from Shanghai; the original chickens from Cochinchina died out and did not contribute to the lineage of the modern day Cochin chickens. Every breed of chicken has a published standard of perfection that describes the physical traits that characterize the breed. The Cochin standard states that males and females should have profuse feathering with thick down in the under-fluff, producing a rather bulky appearance -- in other words, they are bred to be adorable and fluffy. Cochins are recognized in a variety of colors and feather patterns; they come in full-size or bantam varieties. Cochins are known for their calm demeanor, and they are not as prone to wandering off or scratching excessively in the garden as other chickens. They are docile and friendly, and they are easy to house and contain compared with other breeds. Cochin hens are well-known for intense "broody" behavior, meaning that they have strong instincts to raise and care for baby chicks. Cochin hens may go broody regardless of whether fertile eggs are in the nest. Once a Cochin has gone broody, she may remain committed to sitting on her nest for a full 21 days, even if you remove the eggs from the nest and try to physically move her. Cochins are such good mothers that they often raise other types of fowl, including turkeys and ducklings. Cochin roosters are relatively docile and sweet compared with roosters of other breeds, although the bantam roosters are said to have slightly more aggressive personalities than their full-size counterparts. Some Cochin roosters have been known to brood over baby chicks; however, it is recommended to keep Cochin chicks separated from the rooster, even if he is very gentle. Generally speaking, it is advisable to keep 12 hens for every rooster in your pen -- this will reduce fighting between roosters. If your Cochin rooster is housed with a rooster from a more aggressive breed, he could get picked on or attacked by that rooster.